While two of my friends have written articles about Flag Theory (Andrew Henderson from Nomad Capitalist + John Edmund from Flag Theory), I still think there is room to squeeze in a blog post about applying the flag theory in relation to living and working in Asia. We are Global From Asia after all. What Is The Flag Theory? It is the notion that governments are to serve us — they work for us, not the other way around. Yet, as governments have grown in size and power, they believe we are to serve them. In the digital age, I truly believe governments are fearful of losing their power. They see people like the growing “digital nomad” movement as a threat. Anyone with a laptop, internet connection (unfiltered), and a functioning brain (more and more governments want to get rid of that too, if possible) can earn a living from anywhere in the world. No longer are the days where a free thinking entrepreneur or specialist is stuck in one location, to rent an office (government-backed contract), hire staff full time (government-backed contract), and other matters that are clearly connected to a physical space and physical government regulation. People can work from anywhere, earn income from anywhere, and employ people from anywhere. This is scary to governments that want to control us and influence what we do and how we do it. So the flag theory is a structure put in place for the individual, the PT (perpetual traveler), the person who takes no physical location as their 100% source of living. So let’s start to talk about each of these major flags. Please be aware that the flag theory has adapted over the years, but the premise is around the concept above. That individuals are not bound by one country or government. Your ID: Dual Citizenship and Second Passports, & Taxes – Oh My! I cried when I did a podcast about 99 renouncing US citizenship. We are so closely connected to where we are born, to who we are as an individual. It is our identity — literally. Still, as I write this in 2018, many of us are limited to what we can do, where we can go, and our limiting beliefs based on the place our mother was when we entered the Earth. The flag theory is about breaking free from the shackles of our home country’s “identification” (both literally and psychologically). Find a way to get dual citizenship, or at least a step towards converting to a passport that gives you more freedom and power. This topic of dual citizenship is something we haven’t talked about much as Global From Asia, but we have recently invested in an Immigration forum and have talked extensively about crossing the Hong Kong and China border as well as China visas and more. We are investing in researching and writing more about passports, and have a deep blog coming on dual citizenship (will link once ready). On top of this, we are building a full passport directory so you can browse options for your second passport with ease. Again, for our regular Global From Asia readers, you will know I have had a huge issue with banks in Hong Kong over the years for our clients and readers. It is such a pain point and really highlights the threats to the flag theory as time progresses. But to protect yourself, or better yet “hedge” yourself, is to have bank accounts in multiple jurisdictions. We have talked about second bank accounts in a dedicated blog. As we have seen around the world, banks and governments are similar and connected. This means, if a problem comes up in a certain country, for sure the banks will have a problem. And your money (yes, it is yours, not the banks’ or that governments’) can be put in jeopardy. So the flag theory suggests to have various bank accounts in different jurisdictions to protect yourself in case of a government or country has a problem. Or a problem that they connect to you specifically. Countries know that by locking you out of your bank account they can control you, so they can call up their bank(s) in that country and take what is yours and put it into their pockets. So having bank accounts in different countries can at least protect you, from a country-wide problem, or a country-vs-you situation. You can browse our growing Global From Asia bank directory and dive deep into our guides to opening a US bank account or a Hong Kong bank account. Summary on banking and the flag theory — have your money spread out a bit for protection. The Global From Asia website was built from Hong Kong incorporation. More and more digital nomads and internet entrepreneurs from around the world saw the opportunity to leverage the power of Hong Kong as their digital business’ home base. Times are changing, and so is Global From Asia. We have worked with readers and clients in finding the right location for their business setup and the answer “it depends” comes up quite a bit. For the flag theory model, a critical step in implementing is establishing a business in the right jurisdiction for you. Don’t simply incorporate a business in your home country because it’s what your local town’s accountant tells you. Think global, think strategically. While I often tell people to take it step by step, once you are ready and comfortable to go global, Asia has been a hot spot to do just that. As a booming economic center with financial centers such as Hong Kong and Singapore, you can also get comfortable living for a cheaper price just next door. 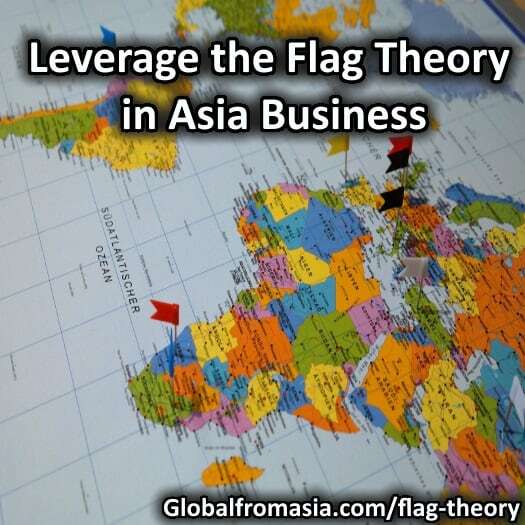 Global From Asia’s core competency since its inception is in giving readers Asia business incorporation news and guides as well services, and this is a key point for flag theory implementation as well. Once you have your foundation established — that is passport, residency tax, bank accounts, corporate structure setup to your liking — take those winnings you will reap and invest them strategically. The flag theory is about diversification. Raw land, physical gold, and the growing digital cryptocurrency are common places a flag theory implementer goes. Investing is a lifelong art and, to many, a fun hobby. Here at Global From Asia we have built out a Global From Asia investments blog to provide news and investor research on ICO reviews, real estate investments, physical assets, and more. Our network of investment advisors can work with you to find your risk tolerance as well as immigration goals to find the right match. Investing is often correlated to cash and capital. But I would say before you have cash and capital, you need to invest in your knowledge and your network. Those are the “assets” that will pay the most interest, the most dividends, and the highest compound than any “physical” or “crypto” asset. And we offer a small pitch to join our GFAVIP membership where you can get both — the knowledge and the network with our special access concierge service. And enjoy learning. At least in the niche and industry you are in. If you don’t enjoy it, you won’t spend time on it, and you won’t improve. Simple as that. The flag theory is also about the lifestyle. Just as we mentioned in the investments section — you need to enjoy it. If you are uncomfortable about “unplugging from the matrix” of the normal life track that society set out for you, take it step by step. By reading this little article, I hope you are inspired to start this flag theory concept. Rome wasn’t built in a day, as they say. You need to take it one step, or one flag, at a time. Many say the offshore (I like to say international) incorporation is the first step, and a big step, to take. That is how Global From Asia was founded, to help readers and podcast listeners get the knowledge and confidence to take that step. So Which Flag Will You Carry Next? Now that you understand the flag theory concept, which one will you jump into first? Here at Global From Asia, we focus on flags related to Asia, but are expanding as we help more people in Asia go global. International (Offshore) Incorporation: We have a blog and podcast full of this, probably best to check out the latest podcasts and blogs in our Corporate Category. Residence and Immigration: Global From Asia has entered this space by helping you with an immigration forum and also a list of our top guides on immigration — to USA, China, and Hong Kong here . Also a great guide on dual citizenship (aka second passports, do I need it?) will be coming soon. Offshore Banking: We like to say international (or even cooler — cross-border) banking. This one has been a huge pain point for Global From Asia readers over the years and we have built out full directories of banks in Asia and other parts of the world here. Investments (Real Estate, Crypto) — Investing is something you do once your offshore bank and corporation is running full steam, and we have been building out an investments sub-site where you can browse crypto investments such as ICO reviews, but also physical assets such as real estate that we get from our partners. Some are close to GFA VIP members only due to the nature and request of those issuing the opportunities. So there you have it. If this is the first time you have heard about the flag theory, it may be eye opening. Many of our friends in the blog space dedicated their lives to this simple concept, and we hope you enjoy the Global From Asia version as well. Now start thinking of your international business as a flag planting journey! Hoorah! What is Your Favorite Flag in the Flag Theory? Leave your mark, or “plant your flag” today. What Is Your Favorite "Flag" in the Theory?